“Imagine Duke Ellington with a paintbrush,” said Sura Wood in the Bay Area Reporter. 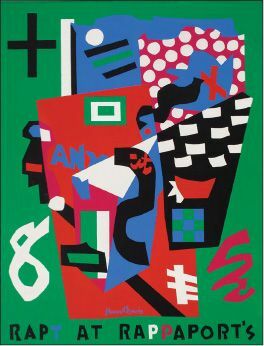 Stuart Davis (1892–1964) brought a similar verve and “on-themove vibe” to modernist painting, translating the energy and syncopation he heard in jazz to hardedged, text-peppered, and color-drenched invocations of 20th-century urban life. Born in Philadelphia in 1892, Davis was a suburban New York teenager when he began studying under the Ashcan School’s Robert Henri. But New York’s 1913 Armory Show exposed Davis to works by Pablo Picasso, Fernand Léger, and Henri Matisse, and soon he was busy Americanizing cubism. A touring exhibition of 75 Davis paintings and studies, currently showing in San Francisco, offers a concise portrait of this important innovator, a key forefather of pop art.